SHOT begins as sound mixer Mark Newman (Wyle), is pumping up the volume on a bloody shootout scene in an action film. Hours later, after an argument with his wife Phoebe (Leal), Mark is suddenly felled by a real random bullet, and lies bleeding on the pavement with a chest wound. With Phoebe desperately trying to stop the bleeding, they both agonizingly wait for an ambulance to arrive as Mark fights for his life. Meanwhile, hidden behind a fence across the street, a teenager, Miguel (Lendeborg), watches in horror with the still smoking gun in his hand. A gun that was just handed to him by his cousin and meant to protect him against gang bullies. From the moment the shot rings out, Kagan's camera in real time daringly follows Mark from the street, to stretcher, to gurney, to examining table, as we watch the paramedics and medical teams in full life-saving mode. Through the imaginative use of split-screen, Kagan juxtaposes Mark's medical crisis with Miguel's moral one, as we simultaneously see the frightened young man wrestle with the fact that an innocent man was injured - or worse - as a direct result of his actions. 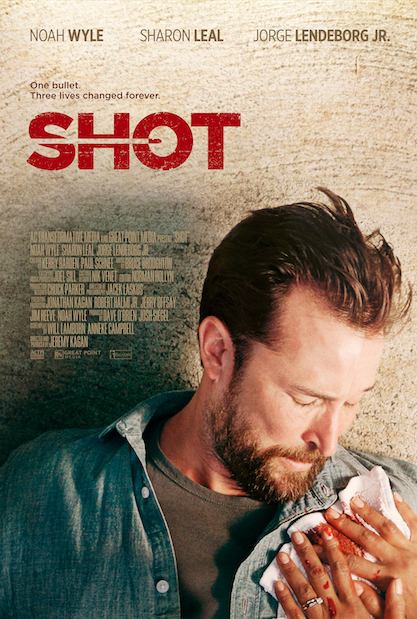 SHOT is directed by Jeremy Kagan and written by Anneke Campbell and Will Lamborn, based on a story by Kagan. The film stars Noah Wyle, Sharon Leal, and Jorge Lendenborg Jr. Producers are Jeremy Kagan, Dave O’Brien, and Josh Siegel. Cinematography by Jacek Laskus, editing by Norman Hollyn, and original music by Bruce Broughton.